Being sick! All 3 of us were sick most of last week with severe allergies, sinus infections, ear infections, the works! We all went to the Dr. and are all on antibiotics. We thought we were on the mend but then Emma got really sick on Sunday night- she started running a high fever and throwing up. It was a very rough night. Monday morning, her fever spiked a 106.2 degrees- yes, even nurse mommy was a tad bit scared! She couldn’t even keep Motrin down. She looked so pitiful. We finally did get some Motrin in her at about noon (while waiting for a 1:00 Dr’s appt.) When we finally made it to the Dr., she was a different child- happy, smiling, 99 degree temp. I have to admit I was a little mad at her. I had called the Dr. twice that morning panicked and when we finally made it there- she looked fine! He said she probably had a virus of some kind. She has had a low-grade fever off- and-on but nothing like 106.2. It must have been a weird 24 hour virus of some kind. Very weird! I’m thankful that it passed quickly. I’m hoping that we are getting all of our winter illnesses out of the way NOW before the baby comes. :) Wishful thinking? I can’t have a post without pictures so here are two unrelated pictures. I love these two pictures of Emma and Nana- taken a little over a week ago. If I haven’t mentioned it already, we moved Emma from her previous room to a room on the other side of the house (farther away from our room) so that the room closest to ours can be the baby’s nursery. The transition was not easy. We really “talked up” her big girl room and her big girl bed, but I honestly think she would have been content to stay in her crib until Kindergarten! Thankfully, things are going better now. She enjoys her room, is sleeping in her bed, and now refers to the nursery as “Baby Foster’s room.” I will post pictures of Emma’s new room in a later post. We spent the last couple of weekends converting the “pink room” to a “blue room.” After looking at a million paint samples, I settled on a Benjamin Moore color called “White Satin”- but it’s actually blue, go figure! Pottery Barn Kids recommends this color and it matches the bedding perfectly. My sweet Aunt Judy helped us tremendously with the painting process. She is always so willing to help out in any way. We could not have done it without her help. I will post pictures of the finished nursery when it is finished, which may be a few more weeks! This is a picture of the room before painting. This was the only room in the house we had not yet painted- this was the color that the entire interior of our house was painted before we got a hold of it- kind of a mauve/pink color. It was fine for Emma’s room, but I was very happy to finally re-paint this room. Robin and Judy painted all day Saturday and Sunday, such hard little workers… I hate to admit that I took a long Sunday afternoon nap while they painted! We painted the closet too because Foster can’t have a pink closet, right? Every morning when I walk by the room, I smile. I’m just so excited to have a little boy on the way! Thanks Robin and Judy for all of your hard work- you two should go into the painting business together, just kidding. The long Labor Day Weekend gave us a great opportunity to travel to Arlington, TX to meet the newest member of our extended family, Baby Zane! Here are a few pictures from our weekend. Pops, multi-tasking: holding baby Zane, preparing for a church activity, and grilling, all at once! Zane hanging out with daddy, Tommy… LITERALLY hanging out! Zane seemed to be very comfortable in this position! This picture was taken the last day we were there- Zane was one week old here. I can’t believe how much he changed in the 4 days we were there! We love you Tommy, Crystal, and Zane. Can’t wait to see you again in a couple of months! I just realized I forgot to post these videos of Emma and her 2nd Cousin Olivia taken during our trip to Colorado. Those girls sure now how to have a good time! In the first video, I think they are pretending to drive cars- this is a great video of Emma laughing! In the 2nd video, they are just swinging each other around and being silly at the reception. Emma has a new cousin! Robin’s sister, Crystal, and brother-in-law, Tommy, had their first baby boy yesterday, August 31st which also happens to be Pops birthday! His name is Zane Curry Williamson and we can’t wait to get our hands on him! Emma is very excited to have a cousin and Robin and I are excited to have a nephew to spoil! 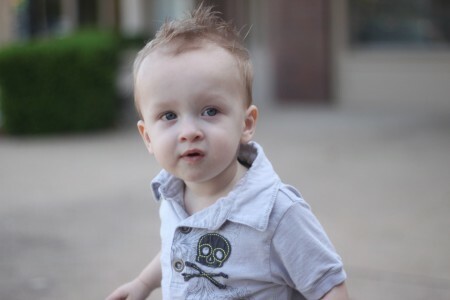 Here are a few pictures of Zane… more to come after we see him in person this weekend! Check out all of that hair! Congratulations Tommy and Crystal- can’t wait to see you guys! Today was a BIG day! Emma has been anxiously waiting for school to start for weeks and weeks. (Mommy has been excited too by the way!) I guess we didn’t really realize how much Emma loved school until the summertime when she didn’t get to go! Emma is in the 2C class at our church which consists of children who are “older 2’s” at the start of school. We could tell she was a little bit nervous this morning- she came into our room very early and wouldn’t stop talking- she’s a chatterbox when she’s nervous. She was very concerned about having new teachers but I know she’ll warm up to them very quickly. When we got to her classroom she immediately walked right in after she saw her good friend, Kaycee who was in her class last year also. Here are some pictures from this morning before school. Miss Emma on the bench in front of our house- Yes, she is holding my iphone- she is addicted to a puzzle game on my phone and doesn’t like to put it down- shouldn’t every 2 year old be holding an iphone in their 1st day of school picture? Emma with her backpack and lunchbox- purchased at JBF last weekend! Nothing like last minute school shopping! This is the cutest picture in the whole world! Doesn’t she look so excited to school? Emma and Kaycee in their new classroom. They were so excited to see each other! Here is a short video of Emma walking into the church- you can tell she’s nervous! And yes, her daddy says “Take your finger out of your nose” in the video! It’s amazing to see how much she’s changed in just one year. Click HERE to see pictures from her first day of school last year. Emma will be going to school 3 days a week this year- Tuesday, Thursday, and Friday. She is already ready to go back on Thursday!